Fall is a fantastic season to spend outdoors—many perennials burst into bloom as the weather cools; others make fantastical seedpods, and trees put on their colorful autumn show. There’s also the flurry of animal activity as migrating birds and butterflies pass through on their way to warmer places, and squirrels and resident birds stock up on food to make it through a New York winter. All of these seasonal changes create prime opportunities to share the life cycles of plants and animals with the children in your life—your kids, grandkids, students, and friends. We’ll be exploring these fall phenomena at our free fall family weekend Discovery Workshops in September and October. Each week, we’ll investigate a different autumnal topic with activities for children and their grownups to participate in together, including a hands-on learning station, story reading, garden scavenger hunts, and a nature project to take home. Join us for a workshop and wander the BBG grounds to discover the wondrous array of plant and animal life on view this fall. Then, look for seasonal changes together in your own neighborhood. A great tool to spur children’s observational skills, curiosity, and creativity is a nature journal. You can create a recycled journal using spare cardboard for the covers, scrap paper for the pages, and kitchen twine for binding. Go for nature walks on your block and record what you find in the journal together—collect and press colorful leaves between the pages; draw and label any animals you see; write down questions, poems, and reflections; and start a collection of interesting street tree seeds. If you can revisit your neighborhood nature walks every week or two, you and your young naturalist will uncover the tiny, subtle changes that create the dramatic transition from summer to winter. Enjoy the season, and visit often! 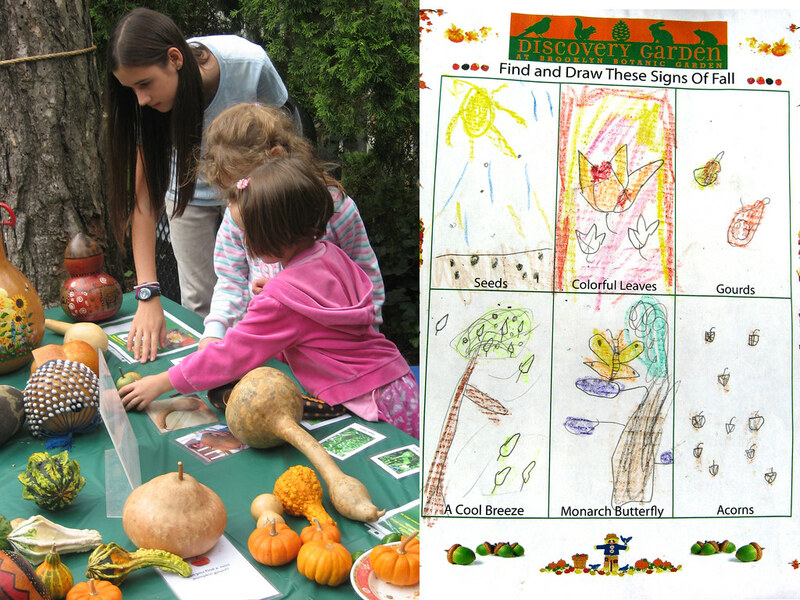 Children investigating the fall harvest and children's artwork from a fall family weekend Discovery Workshop at BBG. Photos by Ashley Gamell.